Ice-free pavement. "Smart snowplows." Vegetable juice ice-melt. Cold-climate researchers at Washington State University are clearing the road with green alternatives to the salt, sand and chemicals typically used for highway snow and ice control. As a nation, "we are kind of salt addicted, like with petroleum, as it's been so cheap and convenient for the last 50 years," said Xianming Shi, associate professor in civil and environmental engineering. This winter, road salt is in short supply across the northern states and in some regions prices have increased by 10 to 30 percent since last year, said Shi. There are also public concerns about salt's impact on the environment and how it will affect future generations. "In 2013, the EPA reported alarming levels of sodium and chloride in groundwater along the East Coast," he said. "Once salt exceeds the legal threshold, there are increased health risks and you can't use it for drinking water." Shi is assistant director of the recently established Center for Environmentally Sustainable Transportation in Cold Climates. It is the only center in the U.S. studying cold climate "road ecology," which includes green snow and ice control plus issues with wildlife crossings, fish passages, dust and the use of recycled materials in pavement. Funded by the U.S. Department of Transportation at $1.4 million for two years, the center is a collaborative effort between the University of Alaska Fairbanks, Montana State University and WSU. Liv Haselbach is the WSU site director for CESTiCC. Shi presented his findings on environmental stewardship practices for winter roadway operations at the American Public Works Association Western Snow and Ice Conference in September. The U.S. spends $2.3 billion each year on the removal of highway snow and ice plus another $5 billion to mitigate the hidden costs associated with the process. That's not counting the costs for city and rural road maintenance, said Shi. The hidden costs include long-term impacts of salt, sand and chemical deicers on the natural environment and road infrastructure as well as short-term impacts on semi-trailer trucks and other vehicles from rust and corrosion. In Washington State, for example, road crews apply roughly four tons of salt per lane mile per winter season, said Shi. "With a four-lane highway, you have 16 tons of salt per year in that one mile segment," he said. "In 50 years, that's about 800 tons of salt in that one mile and 99 percent of it stays in the environment. It doesn't degrade. It's a scary picture." Indeed, and one that pales in comparison to the nine tons of salt per lane mile Shi said is used in Minnesota. "To their credit, state and county agencies are doing a very difficult balancing act," Shi added. "They have to look at safety first and sustainability second. On top of that, they have budget constraints. So, I think research is crucial to help them out." Though snow and ice control can appear quite simple - just plow the road and put on some salt or sand - Shi said getting it right is highly technical and involves detailed science and engineering. His research has led to the advances and evaluation of sensitive new technologies like the smart snowplow, which comes loaded with sensors and is already being integrated into winter fleets, he said. "Ordinary snowplows have at least one sensor to measure pavement temperature. Smart snowplows not only read temperature but also residual salt from previous applications, the presence of ice and the amount of friction on the road. All of these readings help operators apply less salt. "In the past, it was all done visually," Shi explained. "By the time you can see salt on the road, it's way too much and is going into the vegetation and groundwater." Another innovation Shi helped evaluate is the open source software called Maintenance Decision Support System, funded by the Federal Highway Administration. The program can be installed at city maintenance shops or on snowplows. "It can tell you current road and weather conditions, give weather forecasts, inventory salt supplies and suggest application rates based on those variables. It also allows you to model alternative types of salts to see what will happen," he said. At WSU, Shi's passion is cooking up green deicers and ice-free pavement. 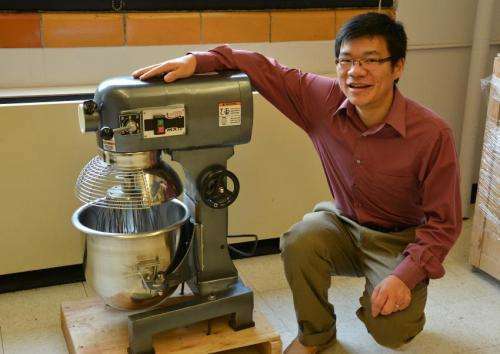 In his laboratory, a brand-new, industrial size mixer awaits his "culinary" genius. "There is a lot of talk about beet and tomato juice deicers that are meant to be less corrosive to vehicles, guard rails, steel bridges and concrete pavement," he said. "They help, but there is still plenty of room for improvement." Besides tweaking the recipes for beet deicer, Shi has successfully developed an ice-melt composed of leftover barley residue from vodka distilleries. He is also mixing up several new types of concrete that can streamline snow and ice removal while protecting the infrastructure. Deicer-resistant concrete, for one, doesn't break down as quickly in the presence of salt and chemicals, thereby extending the life of roads and sidewalks, Shi said. For ice-free concrete, Shi adds nano- and micro-sized particles that make the pavement less prone to icing over. By producing a surface barrier, the mixture prevents bonding with snow and ice. This, in turn, makes plowing easier and decreases the need for salt, he said. Shi hopes to see ice-free pavement also used for sidewalks and parking lots. "Our ultimate goal is to apply the best amount of salt, sand or deicers at the right location at the right time," he said. Getting salty: Can beet juice, other alternatives help to keep the nation's highways ice-free?